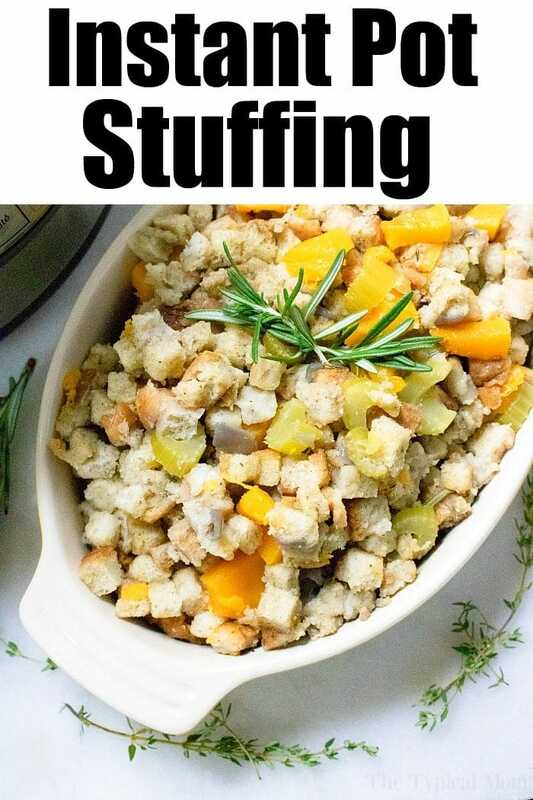 Instant Pot stuffing is the perfect side dish for Thanksgiving or served with chicken throughout the year. Pressure cooker side dishes are tasty and fast! 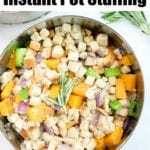 This Instant Pot stuffing is now added to that post and our page full of Instant Pot recipes that will give you dinner ideas for months on end. If you’re looking for a side dish for the holidays or now this is a great one to try. We have been coming up with a bunch of easy Instant Pot Thanksgiving recipes here on The Typical Mom so you can relax a bit during the holidays and not have the stress of fitting everything in your oven! Butternut squash was added to this version but if you’d rather leave that out that isn’t a problem. Just omit that and follow the rest of the recipe on how to make stuffing in your pressure cooker. I do think squash is a great addition to a variety of dishes though. I wasn’t a believer until this year when we made homemade pumpkin butter and stuffed Instant Pot spaghetti squash. They were both amazing and cooked so fast too. This is the second step after your squash is tender. Then you’re ready to make Instant Pot stuffing. 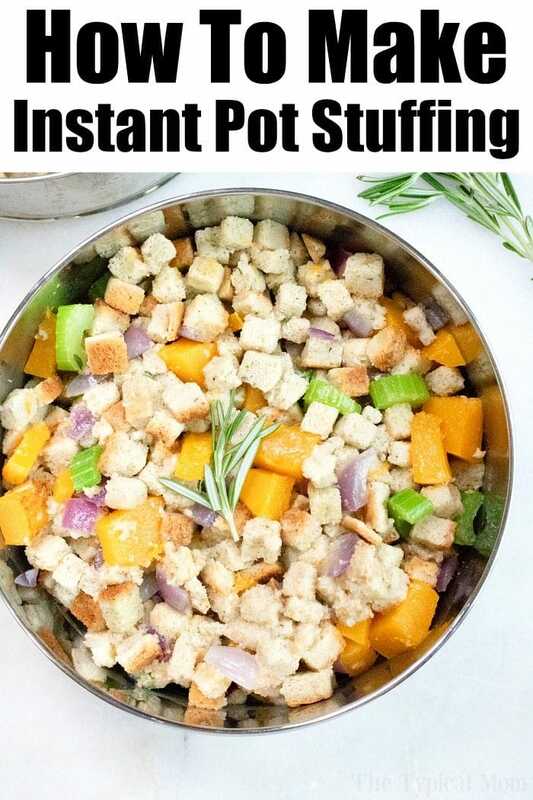 You will need to utilize the PIP method to make this Instant Pot stuffing. If you have never done this before it is easy peasy. You will need a few Instant Pot accessories for pot in pot. Why use the PIP method? Here’s the printable recipe to follow, this makes 2 pots full. You can use either containers below. I suggest you purchase one that you think you’ll use most often for other recipes as well to get the most bang for your buck. 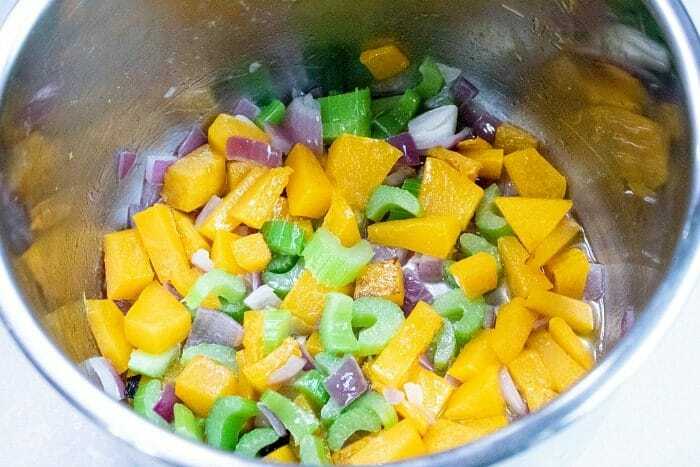 If you're adding butternut squash you'll want to put on a baking sheet, diced, and bake at 350 F with olive oil until slightly tender, about 10-15 minutes. Turn Instant Pot on to saute and add the onion and celery together with your butter for 2-3 minutes or until tender. 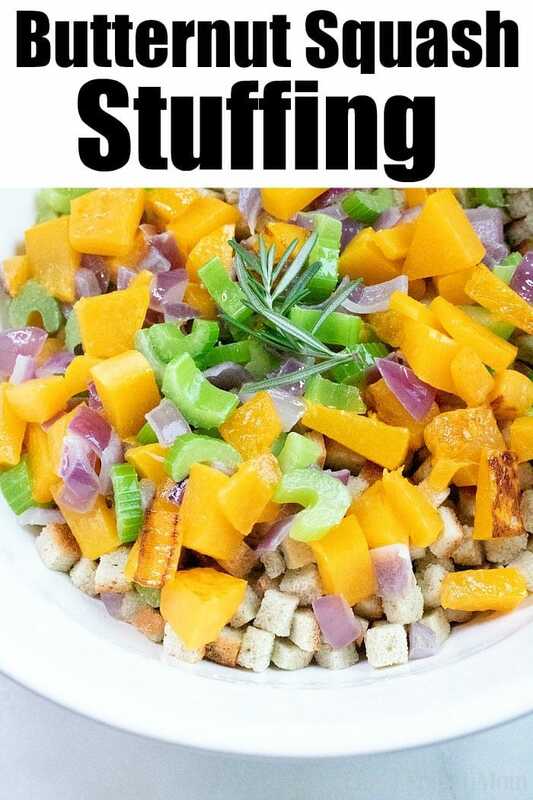 Gently mix dry stuffing mix in large bowl with the onions and celery you just sauteed, and the roasted squash if you're adding that. Transfer this mix into a casserole dish (makes 2 dishes full) or stacked metal cooking pans that fit inside of your Instant Pot. Sprinkle rosemary and thyme to the top of the stuffing. If using casserole dish cover with foil, stacked pans have lids so put those on and secure them together. Add 1 ½ cups of water to the inner pot of the Instant Pot. Lower the pan with the stuffing in to the inner pot on a trivet. Close the Instant Pot lid and steam valve, then cook on high pressure for 20 minutes. Do a quick release. If using a casserole dish you'll do this again for the 2nd batch.